October 25, 2018 – The coin find of Thun was discovered during road pipe works on March 4, 1955. 2,300 to 2,400 coins, all of which were struck in the second half of the 3rd century B.C., were found in a bronze jar. The most recent coins date back to the year 293 and were thus minted before the comprehensive coinage reform of Diocletian, who created entirely new denominations like the nummus and argenteus. It appears as though someone had not trusted these new coins and had considered the rate at which he was supposed to exchange his good old coins unacceptable. Consequently, he had buried the treasure in the ground. That is where it remained, partly because the coins were demonetized and the owner could not purchase anything with them anymore. They stayed hidden until the road worker found them in 1955. Now they have been published and edited by Sylviane Estiot, Suzanne Frey-Kupper and Pierre Zanchi as Volume 15 of the Swiss Inventory of Coin Finds monographic series. 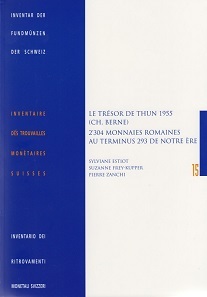 Sylviane Estiot, Suzanne Frey-Kupper, Pierre Zanchi, Le trésor de Thun 1955 (CH, Berne) 2.304 monnaies romaines au terminus 293 de notre ère. Inventaire des Trouvailles Monetaires Suisse 15. Berne 2017. 202 pp. 52 plates including CD-ROM. Paperback, 210 x 297 mm. ISBN 978-2-940086-14-6. 55 CHF. The place where the treasure was found, Thun, is a small town at the foot of the Swiss Alps. Tourists love the marvelous castle with its early 12th century keep. Lovers of nature know that Lake Thun with its panoramic view of the Alps has been added to the list of UNESCO Natural Heritage Sites. The Roman heritage of Thun, however, is less known. Nevertheless, said town was an important junction at the trade route between Italy and Germania. It was there that goods, which had been arduously carried across the mountains, were transferred onto ships. Which is why the Roman heritage of Thun is rich. A temple complex, a small settlement – and an important treasure of Roman coins were all found there. A detailed scholarly analysis of said treasure can be found in Volume 15 of the Swiss Inventory of Coin Finds. It covers the external circumstances of the find as well as the archaeological context. But it also deals with the numismatic side of the find, i.e. new findings which can be taken from the coins found in Thun regarding the coinage of the barracks emperors. In order to do that, the 2,302 antoniniani / aureliani and two denarii are described and analyzed. After all, many questions that numismatics of the second half of the third century deal with remain unanswered. The large number of quickly alternating mints, which the historical crises – just think about the rapid turnover of rulers and the numerous anti-emperors – forced to strike large numbers of coins in a short amount of time, they present many fundamental problems that can only be resolved by means of the material. Which is why the presentation of as many hoard finds of this period as possible is so important for research. Although the price of such coins on the free market is lower than what a picture and scholarly analysis of them might cost, the gain in terms of numismatic insights is much higher. There is a reason why the outdated RIC volume dealing with the coins of the barracks emperors has not been re-written yet … the material is enormous and only a fraction has been made available for research so far. Along with the numismatic evaluation, the book also contains a short catalog of the 2,304 pieces, including legends of the obverse and reverse as well as the type of reverse, officina, citation, weight, and die axis. The majority of the material is depicted on the 52 plates. A CD-ROM is also enclosed containing pictures of all of the coins as well as an Excel spreadsheet which facilitate browsing the material. Even though the book was written in French, detailed summaries are offered in German and English, which makes it easy to use even for those who do not know much French. The book is well worth the purchase for all those who deal with the time of the barracks emperors academically. And it also helps all those who set great store by a complete and scholarly cataloging, as it presents an abundance of material which cannot be found in the RIC. This link takes you to the order form.